Henan province, in Central China, has seen some of the worst religious persecution, and has served as a model for repression across China. An anonymous government insider provided Bitter Winter with data regarding religious persecution that occurred in Henan Province’s Xinxiang city in 2018. The Chinese government has also been working hard to promote its religious policies. In 2018, more than 200 religious policy study classes were held for clergy members and staff of the United Front Work Department and the Religious Affairs Bureau. More than 1,000 propaganda billboards were made to promote the new Regulations on Religious Affairs, ensuring that every religious venue displays such a billboard prominently. 350,000 copies of A Letter to the Parents of Minors were distributed to promote anti-religious educational content. Students’ parents were required to sign the letter, and copies were retrieved from parents for storage. More than 600,000 propaganda sheets promoting religious policies and regulations were printed and distributed. More than 20,000 tote bags with the government’s propaganda on them and other propaganda materials were made, and 74 cultural performances were held in the countryside to promote the CCP’s religious policies. Also, Jehovah’s Witnesses, South Korea’s “Shincheonji Church,” the “Light of Life,” “Good News Church,” and other religious groups have all been severely suppressed. The government set up a task force on the pretext of “investigating organizations infiltrating from abroad,” and punished more than 100 Christians. Among them were 13 members of Jehovah’s Witnesses from both domestic and foreign countries (with seven Jehovah’s Witnesses meeting venues shut down), 28 people from the Light of Life, 83 people from Good News Church, and seven people from South Korea’s Shincheonji Church. 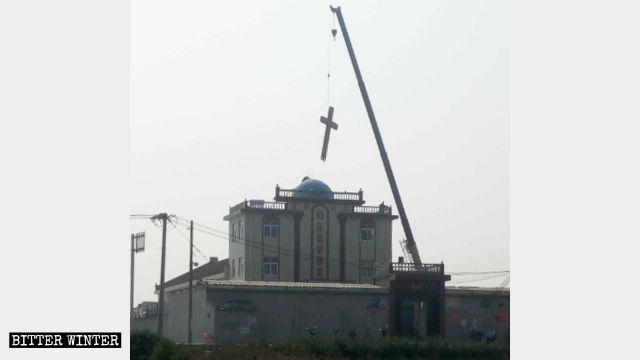 The underground Catholic churches in Xinxiang city are also targets of suppression. Underground priest Ding Wanshan and underground bishop Zhang Weizhu were targeted in crackdowns while holding religious activities in Huojia county and Weibin district, and in Fengqiu county, respectively. The local government shut down the “Sha Wei Youth Group” established by underground priest Yan Shawei in Weibin district. There has also been a sweeping crackdown on Islamic religious venues. In total, 14 public buildings with elements of “Saudization” or “Arabization” have been remodeled. Halal canteens at 40 schools and enterprises were “reformed.” Besides, 16 companies were targeted due to concerns about the “spread of halal,” destroying more than 900,000 packages of goods labeled as halal.